In August of 2000 my sisters and I joined our father and attended a Clan Macrae Millennium Gathering. We embarked on an incredible journey to our ancestors homeland, Scotland. from Scotland, New Zealand, Australia, Canada and the United States. where they lived and died in peacetime and in war. We followed our ancestors footprints and visited the lands where they fought and died. Visited several sites of monuments in honor of the Macraes. I learned how those brave men and women made their mark on Scotland and the world! 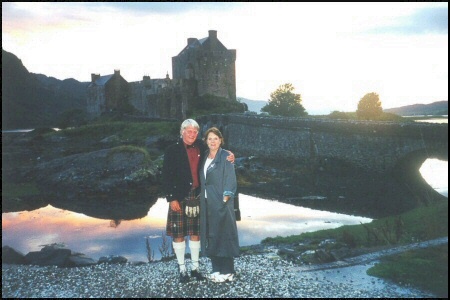 This is a picture of Iain MacDonald, our wonderful tour guide, and Me in front of the Eilean Donan Castle. the Clan Macrae Seat of Scotland! My heart was torn from Scotland when our trip came to an end. Upon returning home, my dream was to bring the Scottish flavor to my area. I chose to go to work and build a business around the treasures I could locate in Scotland. Northglen Antiques offers furniture of the highest quality and collectibles coming directly from Scotland.